Kavanaugh's hearing before the Senate Judiciary Committee began on Tuesday, but Democrats, including Booker and Harris, immediately interrupted the committee chairman, Sen. Chuck Grassley (R., Iowa). Democratic senators urged the committee to adjourn because the White House released additional documents Monday night from Kavanaugh's time with the George W. Bush administration. They said the hearings should be delayed because they haven't had time to review the documents and not all documents have been released. She asked supporters to sign her petition to stop the Kavanaugh hearing until more documents could be released. Democrats are requesting documents from Kavanaugh's time as former President George W. Bush's staff secretary. While over 415,000 pages of documents have already been released, others are currently being withheld under executive privilege. Harris said in her email that Kavanaugh puts "so many of our hard won civil rights—and the rule of law itself—on the line." Before Kavanaugh was announced as the nominee, Harris said whoever President Donald Trump nominated represented the "destruction" of the U.S. Constitution. In a tweet on Tuesday morning, Harris claimed, "The truth is Republicans are rushing through this hearing because Kavanaugh is the least popular nominee in decades and the more the public learns about his record, the less they want him confirmed to the highest court in the land." The truth is Republicans are rushing through this hearing because Kavanaugh is the least popular nominee in decades and the more the public learns about his record, the less they want him confirmed to the highest court in the land. Booker's fundraising email was sent out an hour after the hearing began. "We should all be concerned about what it would mean for our country if Judge Kavanaugh is confirmed to the Supreme Court," the email stated. 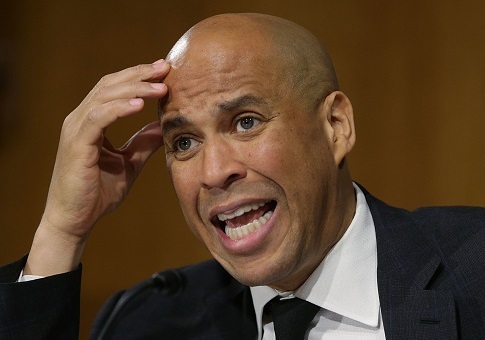 Booker's email went on to say he is opposing Kavanaugh's nomination in order to ensure the special counsel investigation continues. "Sending out fundraising emails DURING A HEARING about opposition to a Supreme Court nominee is not the job of a Senator. It is cynical play-acting for a political base," Sasse tweeted. Harris and Booker both announced before the hearing they will vote against Kavanaugh's confirmation. Both senators are considered potential 2020 presidential nominees. This entry was posted in Politics and tagged Cory Booker, Kamala Harris. Bookmark the permalink.